She’s Delightful, a lovely 4-year-old grey/roan daughter of New York sire Mission Impazible, emerged as the top-selling New York-bred at the two-day Fasig-Tipton winter mixed sale held this Monday and Tuesday in Lexington, Kentucky. A three-time winner bred by Sequel Thoroughbreds and JMJ Racing Stables and offered as a racing or broodmare prospect from the consignment of James M. Herbener Jr., Agent V as Hip 330, She’s Delightful was purchased by Gainesway Farm for $200,000 in the second session of the auction, making her the co-third top-seller of the sale. She’s Delightful has an eye-catching pedigree. She is a daughter of graded winner and Grade 1 placed Chimichurri, who fetched $2.1 million from Stonestreet Mares at the 2005 Keeneland November breeding stock sale. She is also a half-sister to Loving Vindication, who is the dam of Queens Plate and Prince of Wales winner, and Kentucky Oaks runner-up Wonder Gadot, the 2017 Sovereign Award champion 2-year-old filly ($1,492,461). Loving Vindication is also the dam of stakes winner and graded stakes performer Solemn Tribute. The extended female family includes grade/group 1 winners Mashaallah and Folk Art and stakes winner and sire Sportin’ Life. Trained by Bruce Brown for Our Sugar Bear Stable who purchased her at OBS March in 2017 for $40,000, She’s Delightful broke her maiden as a juvenile going 6 1/2 furlongs at Aqueduct, before going to two more races at four and earn $132,858. 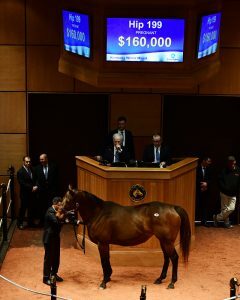 The New York-bred topper of the sale’s opening session, and second-highest selling New York-bred at the auction, was Kitty Panda, a 9-year-old dark bay/brown mare by Sky Mesa from the family of Audible. Bred by Oak Bluff Stables, LLC and consigned by Winter Quarter Farm, Agent, Kitty Panda sold in foal to Blame on a May 28 cover to Fred Hertrich for $160,000 (Hip 199). Kitty Panda’s dam, the Gulch mare Fahamore, was unplaced on the racetrack but has turned out to be a highly distinguished producer. Purchased by Don Robinson for $37,000 at Keeneland’s 2003 November sale, Fahamore’s second foal was Akilina, a multiple stakes winner and graded stakes performer and earner of over $300,000. 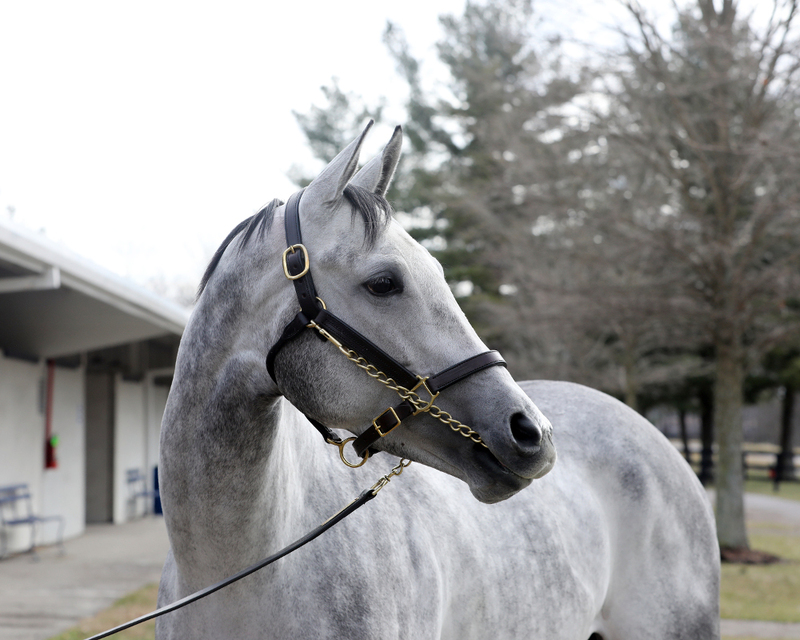 Akilina has gone on to produce stakes winners Rieno Tesoro, who is Group 1-placed in Japan and has earned over $1.3 million, and multiple graded stakes-placed Governor Malibu ($665,700). 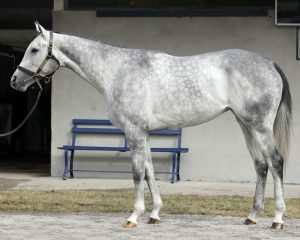 Fahamore’s first foal, Blue Devil Bel by Gilded Time, is the dam of Grade 1 Florida Derby winner Audible ($1,770,520). The top New York-bred short yearling at the sale, and top short yearling of session two, was a bay youngster by Palace bred by JRita Young Thoroughbreds, LLC and foaled on January 27, 2018. Offered as Hip 334 and consigned by Endeavor Farm, Agent, the colt was hammered down to Billy Williams for $75,000. Hip 334 is the second foal from Louisiana-bred Silk’s Diamond (Forefathers). Unplaced in her lone start, Silk’s Diamond is a half-sister to multiple stakes winner Su Casa G Casa (During). The colt’s third dam is stakes winner Tucked Inside, who has gone on to become a multiple stakes producer. The average price for the New York-breds at the Fasig-Tipton winter mixed auction came in at $38,239, which significantly outperformed the overall sale average of $29,539 (up 3% from last year). The New York-bred median price of $14,000 came in just a tick below the sale median of $15,000 (up 42.8% from last year). In all 26 New York-breds sold of 33 offered for a buy-back percentage of 21.2%, on par with the sale’s overall RNA rate of 20.4%. With the breeding stock and mixed sales now in the rear-view, Fasig-Tipton’s next sale on the calendar is the boutique Gulfstream 2-year-old sale on March 27.